A great article on the emerging SMAQ stack for big data. I wonder if PIG does spatial? For a deep dive into the bracing waters of cutting-edge computational geometry, check out the online proceedings of the Canadian Conference of Computational Geometry. Do NOT expect to see these algorithms appear in JTS anytime soon! The geo-blogosphere has been buzzing about the global Facebook friends visualization. This was done by Paul Butler using an R script and some clever techniques for working with geodetic data. This kind of lightweight spatial analysis and visualization is squarely in the target zone for JEQL, so I thought I'd try something similar. 3,"Mount Hagen","Mount Hagen","Papua New Guinea","HGU","AYMH",-5.826789,144.295861,5388,10,"U"
For good measure I also added a background rendering of world land areas, as well as a country boundary layer on top. To avoid swamping the map, only routes with more than one flight listed are displayed. That's about 40 lines of code, with only 9 statements. Not a bad LOC score... Of course the heavy lifting of handling geodetic data is done by Java functions, but that's part of the point. JEQL makes it easy to link to Java code, since that's a more appropriate technology for creating performant, resusable code. The continent outlines aren't revealed as crisply as the Facebook friends map. That's because friend links tend to be more spatially coherent than airline routes (unless your acquaintances all have private jets). 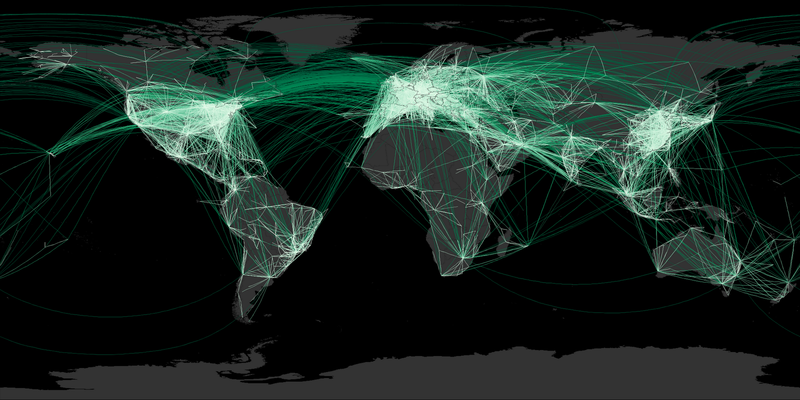 But it certainly shows where the world hotspots are for air traffic. Boy, those Europeans love to fly!